This pre-supposes that all projects are well conceived in the first place. It also supposes that people with concerns are first and foremost grumps and not people with the personal conviction to voice genuine concerns. I have heard people managing projects say (really) that it’s better to fail as a team than to succeed on the basis of an individual. There are certainly grumps to be seen and heard in the world, but do they really outnumber the number of projects that are ultimately doomed for other reasons? Are the grumps sometimes used as a reason why projects fizzle and fade away when the reality is that the projects should never have seen light of day in the first place. When I am faced with a grump, the first thing I do is listen! I listen because I might have got it wrong, I might have missed something or there might be a better way of doing something. It might also be the case that project delivery is impossible for real reasons – I would rather know now when I can do something about it than when it’s too late and I am trying to justify the failure right at the end. If the grump is talking rubbish, say so and say why it’s so. If there is a good reason why it’s so, it’s easy to say why it’s so, if there is no good reason and you are having difficulty countering the grump, perhaps the grump has a point. I have seen lots of projects that were doomed from the start, but no one wanted to listen to the grump. If you have a big wallet, you can ignore the grump, but wouldn’t you rather keep your wad intact? Thanks for the comment. I agree with many of your points, especially the need to ensure that the project is well-founded, and the need to listen. The article, however, is based on my experience that many customer experience projects run into the ground because project teams find themselves spending more time placating Grumps than focusing on the customer. I wanted to give people some tips for dealing with this situation. You also implicitly draw attention to a another good point. 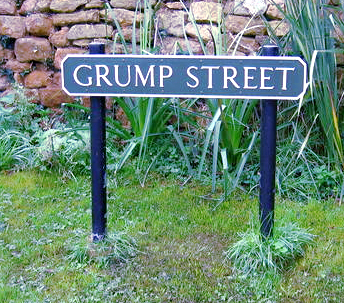 A person with an objection is not necessarily a Grump – what makes someone a Grump is much to do with their intent and effect on the group than the fact that they have some concerns. As a result of your comment, it sounds like another post on ensuring that a project is well-founded might be useful, so thank you.